by Chris Woodford. Last updated: May 22, 2018. Imagine for a moment if all the wireless connections in the world were instantly replaced by cables. You'd have cables stretching through the air from every radio in every home hundreds of miles back to the transmitters. You'd have wires reaching from every cellphone to every phone mast. Radio-controlled cars would disappear too, replaced by yet more cables. You couldn't step out of the door without tripping over cables. You couldn't fly a plane through the sky without getting tangled up. If you peered through your window, you'd see nothing at all but a cats-cradle of wires. That, then, is the brilliance of wireless: it does away with all those cables, leaving our lives simple, uncluttered, and free! Let's take a closer look at how it works. Photo: A typical wireless router. This one, made by Netgear, can connect up to four different computers to the Internet at once using wired connections, because it has four ethernet sockets. But—in theory—it can connect far more machines using wireless. The white bar sticking out of the back is the wireless antenna. Wireless started out as a way of sending audio programs through the air. Pretty soon we started calling it radio and, when pictures were added to the signal, TV was born. The word "wireless" had become pretty old-fashioned by the mid-20th century, but over the last few years it's made a comeback. Now it's hip to be wireless once again thanks to the Internet. Back in 2007, approximately half of all the world's Internet users were using some kind of wireless access. In 2018, around 80 percent of us use wireless to get online at home, which is hardly surprising now more of us now are using smartphones and tablets (55.3 percent) than desktop computers (44.7 percent). Wireless, mobile Internet is overwhelming popular in developing countries where traditional wired forms of access, based on telephone networks, are not available. Wireless Internet, perhaps best known to us as Wi-Fi®, has made the Internet more convenient than ever before. But what makes it different from ordinary Internet access? Radio is an invisible game of throw-and-catch. Instead of throwing a ball from one person to another, you send information, coded as a pattern of electricity and magnetism, from a transmitter (the thrower) to a receiver (the catcher)—both of which are kinds of antennas. The transmitter is a piece of equipment that turns electrical signals (such as the sound of someone speaking, in radio, or a picture, in TV) into an oscillating electromagnetic wave that beams through the air, in a straight line, at the speed of light (300,000 km 186,000 miles per second). The receiver is a mirror-image piece of equipment that catches the waves and turns them back into electrical signals—so we can recreate the radio sounds or TV pictures. The more powerful the transmitter and receiver, the further apart they can be spaced. Radio stations use gigantic transmitters, and that's why we can pick up radio signals from thousands of miles away on the opposite side of Earth. Wireless Internet is simply a way of using radio waves to send and receive Internet data instead of radio sounds or TV pictures. But, unlike radio and TV, it is typically used to send signals only over relatively short distances with low-power transmitters. Artwork: The basic concept of radio: sending messages from a transmitter to a receiver at the speed of light using radio waves. In wireless Internet, the communication is two-way: there's a transmitter and receiver in both your computer (or handheld device) and the piece of equipment (such as a router) that connects you to the Internet. If you have wireless Internet access at home, you probably have a little box called a router that plugs into your telephone socket. This kind of router is a bit like a sophisticated modem: it's a standalone computer whose job is to relay connections to and from the Internet. 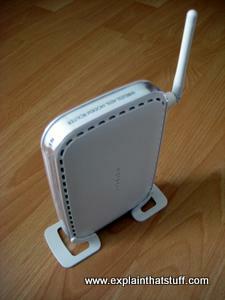 At home, you might use a router to connect several computers to the Internet at once (saving on the need for several separate modems). In other words, the router does two jobs: it creates a wireless computer network, linking all your computers together, and it also gives all your machines a shared gateway to the Internet. Charts: There's been huge worldwide growth in cellphones (mobile phones) and wireless Internet access over the last couple of decades, particularly in developing countries. In 2000, there were 0.7 billion cellphone subscriptions worldwide and 71 percent of them were in high-income (developed) countries. By 2015, the position had almost reversed: there were 10 times more subscriptions (roughly 7 billion) and 78 percent of them were in developing countries. The implications for Internet access are obvious: more and more people are going online from wireless mobile devices, especially in the developing world. Sources: 2012 Information and Communications for Development: Maximizing Mobile, World Bank, 2012; United Nations ITU-T, May 2014. A wireless router is simply a router that connects to your computer (or computers) using radio waves instead of cables. It contains a very low-power radio transmitter and receiver, with a maximum range of about 90 meters or 300 ft, depending on what your walls are made of and what other electrical equipment is nearby. The router can send and receive Internet data to any computer in your home that is also equipped with wireless access (so each computer on the wireless network has to have a radio transmitter and receiver in it too). Most new laptops come with wireless cards built in. For older laptops, you can usually plug a wireless adapter card into the PCMCIA or USB socket. In effect, the router becomes an informal access point for the Internet, creating an invisible "cloud" of wireless connectivity all around it, known as a hotspot. Any computer inside this cloud can connect into the network, forming a wireless LAN. 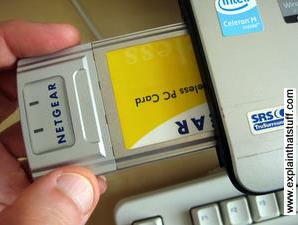 Photo: If your laptop doesn't have a built-in Wi-Fi card, you can plug in a PCMCIA adapter card like this one. They're relatively inexpensive, especially if you get them on eBay. But beware: older PCMCIA cards may not support newer forms of wireless security such as WPA. Just as computers connected to a wired LAN use Ethernet, machines on a wireless LAN use the wireless equivalent, which is called Wi-Fi (or, more technically, IEEE 802.11). Wireless Internet is improving all the time, so better forms of Wi-Fi are constantly evolving. You may see wireless equipment marked 802.11a, 802.11b, 802.11g or 802.11n: these are all broadly compatible variants of 802.11, with 802.11n, 802.11g and 802.11a somewhat faster than 802.11b. Other more recent variants are named 802.11a with an extra letter added on the end (such as 802.11ax, 802.11ay, and so on). For example, 802.11ah is designed to work with the so-called Internet of Things, 802.11ax is for high-efficiency LANs, and 802.11az is concerned with "location services" (finding the accurate position of mobile devices). Wi-Fi is where the expression Wi-Fi hotspot comes from. A Wi-Fi hotspot is simply a public place where you can connect your computer wirelessly to the Internet. The hotspots you find in airports, coffee bars, bookshops, and college campuses use one or more wireless routers to create wireless Net access over a large area. Even bigger networks can be created by using tens or hundreds of access points to span entire university campuses, for example. Since the mid-2000s, many cities worldwide have turned huge areas into public hotspots (an idea sometimes known as Municipal Wi-Fi, Muni Wi-Fi, or Muni-Fi). Wi-Fi hotspots continue to pop up all over the world and the number is growing at an astonishing rate. By 2007, there were estimated to be around 180,000 in the United States alone; at the time this artice was last updated (May 2018), according to Wi-Fi specialist called iPass, the worldwide total was almost 341 million. Wi-Fi Direct®: Let's cut out the middleman! People sometimes confuse Wi-Fi and Bluetooth. Both are methods of connecting gadgets without wires, so what exactly is the difference? Broadly speaking, Bluetooth is a way of connecting two relatively nearby gadgets without the hassle of using a cable, whereas Wi-Fi is a method of linking wireless computers (and particularly mobile ones, such as laptops, tablets, and smartphones) to the Internet through a shared connection point—your router—which typically makes a wired connection to a telephone or cable line. At least, that's how things used to be. Artwork: Wi-Fi modes: Left: In infrastructure mode, all your devices communicate wirelessly with a central router that talks (usually via a wired connection) to the Internet. Here, three tablets and a laptop are talking to a router in the middle. 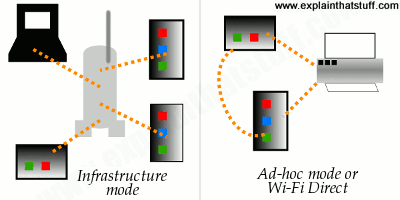 Right: In ad-hoc mode (or with Wi-Fi Direct), devices communicate directly over a temporary network without any kind of central router. In this example, two tablets are talking to one another and to a shared printer using Wi-Fi Direct. But nothing says Wi-Fi can't also link two laptops or smartphones directly instead of Bluetooth. Normally, Wi-Fi uses infrastructure mode, in which various gadgets and devices communicate through a router or central access point. But Wi-Fi also has what's called an ad-hoc mode, which allows gadgets to communicate directly without a router. Typically, an ad-hoc network is created as a temporary form of communication—as the name ad-hoc suggests—whereas infrastructure-mode is a more permanent thing. (The Wi-Fi network I'm using at the moment, for example, is one I set up about a decade ago using infrastructure mode and a central router as the access point.) Ad-hoc networks tend to be hard to set up, slower, and less reliable because the various devices using them all have to communicate with each other and manage the networking (unlike infrastructure networks, which are managed by the router that also handles the communications between them). Some household gadgetry relies on a mixture of Wi-Fi and Bluetooth, which can be a bit confusing—and prompts the question "Why can't Wi-Fi do the short-range, ad-hoc bit as well?" With a bolt-on addition to the basic Wi-Fi spec known as Wi-Fi Direct®, it can. The basic idea is to use secure, encrypted Wi-Fi in a much more informal way for things like printing from a tablet or sharing photos with someone else's smartphone. Putting it a bit more technically, Wi-Fi Direct is an ad-hoc, peer-to-peer form of networking between pairs of nearby devices (sometimes multiple devices) that doesn't rely on an Internet connection. It works in a similar way to traditional Wi-Fi: each device lets others nearby know that you can connect to it (much like the way access points let you know about available Wi-Fi networks nearby). Some devices can connect both to Wi-Fi Direct and a Wi-Fi network at the same time; others can only do one or the other at a time. How does Wi-Fi Direct compare to Bluetooth? It's up to 10 times faster at transferring data (250mbps compared to 25mbps) and has a range several times longer (up to 200m or 650ft compared to a maximum of about 60m or 200ft for Bluetooth). Although both are secure, Wi-Fi Direct uses Wi-Fi's WPA-2 encryption, which uses twice as many bits (256) as Bluetooth's (128 bit) and is theoretically much more secure. In Bluetooth's favor, it allows more devices to connect at once, and while its shorter range might seem like a drawback, it means it uses less power than Wi-Fi (an extremely important consideration for mobile devices). 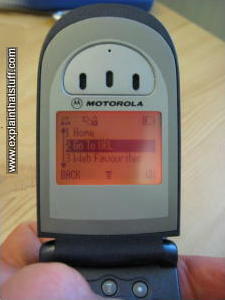 Photo: State-of-the-art Web browsing c.2002 on an old-fashioned cellphone! This phone is using WAP to browse breaking news on a website called Ananova. Note the crude, monochrome text-only screen. What you can't see here is the grindingly slow speed, which was about 5 times slower even than old-fashioned, dialup Internet access. Photo: Mobile broadband (with a smartphone or USB modem) is the fastest growing form of wireless Internet. According to the ITU-T, the worldwide market grew 12-fold between 2007 and 2015, and was expected to reach 4.3 billion users by the end of 2017. Wi-Fi isn't the only way to access the Internet wirelessly. If you have a reasonably new smartphone (an advanced kind of cellphone), such as an iPhone or an Android, it'll have a miniature Web browser that works in exactly the same way as the one you'd find on a laptop (albeit using a much smaller screen). In the late 1990s and early 2000s, some cellphones had very crude built-in web browsers that could haul up simplified, text-versions of web pages using a system called WAP (technically known as Wireless Application Protocol, though no-one ever called it that). WAP was very slow to take off and has now been rendered obsolete by faster cellphone networks and smartphones. While Europe and North America were struggling with WAP, Japan's cellphone users already had a much better version of cellphone Internet called i-mode that offered fast access to web pages and emails. i-mode was always more popular than WAP and was gradually exported to a number of other countries. However, it too has now been superseded by better technologies based on faster 3G and 4G (third- and fourth-generation) cellphone networks. Effectively, mobile and desktop Internet have now converged: thanks to wireless, and the arrival of easy-to-use apps tailored to mobile devices, it's as easy to do things on your cellphone or tablet computer as it is on your desktop PC. 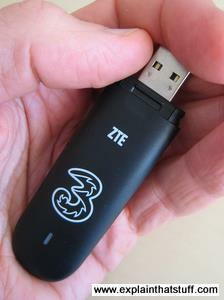 If you want to find out more about high-speed mobile, wireless broadband (broadband Internet access using a USB modem to connect to a cellphone network), please see our separate article on broadband and mobile broadband. Make sure you secure your network (with what's called a pre-shared key or PSK). Use the strongest form of security your hardware supports: use WPA2 rather than WPA and use WPA in preference to WEP. Choose a nontrivial password (and certainly not something your neighbors could easily guess, like your surname). At the very least, if you're going to use an easy-to-remember password, put a special character ($, %, and so on) at the beginning or the end of it—you'll make it vastly more secure. Set up your network to use an access control list (ACL). This is a list of specific, trusted computers that will be allowed to connect to your network. For each computer on the list, you'll need to specify what's called its MAC address (or LAN MAC address). You'll find the MAC address written on the bottom of a laptop computer, round the back of a desktop, or on the bottom of a plug-in PCMCIA network card. If you have only one computer and it never moves from your desktop, which is reasonably close to your router, don't use wireless at all. 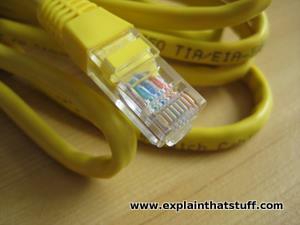 Connect with an Ethernet cable instead and use your network in wired mode. It'll be faster as well as more secure. You could make your network a "hidden" one (in other words, so the network name (SSID) is not broadcast). Only people who know the network name can connect by typing in the correct SSID and password. Hidden networks can sometimes be a bit erratic if you use Windows XP and Microsoft's default networking software, but they work fine with most other systems. Opinions vary on whether hidden networks do anything for security. Some people claim they are more secure; others say they have security risks. 1888: German physicist Heinrich Hertz (1857–1894) makes the first electromagnetic radio waves in his lab. 1894: British physicist Sir Oliver Lodge (1851–1940) sends the first message using radio waves in Oxford, England. 1899: Italian inventor Guglielmo Marconi (1874–1937) sends radio waves across the English Channel. By 1901. 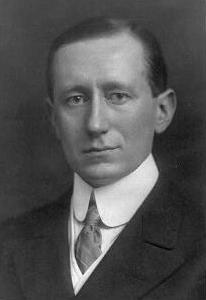 Marconi has sent radio waves across the Atlantic, from Cornwall in England to Newfoundland. 1940s: Taxi firms begin using two-way radios. 1944: Hedy Kiesler Markey (better known as the actress Hedy Lamarr) and George Antheil patent spread spectrum frequency hopping, a way of making wireless communication more reliable and secure by transmitting and receiving on different radio frequencies. 1970s: First analog cellphones appear, developed in Chicago by Illinois Bell and AT&T. 1980s: GSM (Global System for Mobile communications) digital cellphones appears in Europe, followed by PCS (Personal Communications Services) phones in the United States. 1990: A working group of wireless experts begins work drafting the standard that will become Wi-Fi. 1994: Nokia, Finnish cellphone maker, sends data over a cellphone network. 1994: Phone.com develops WAP in the United States. 1997: Wi-Fi standard (IEEE 802.11) is agreed internationally. 1998: The name "Bluetooth" is officially adopted for a proposed new kind of short-distance wireless link. 1999: Japanese telecommunications company NTT DoCoMo develops i-mode. 1999: Steve Jobs of Apple Computer decides to incorporate a version of Wi-Fi called AirPort into the iBook laptop, effectively making it the first mass-market Wi-Fi product. 2000: The first Bluetooth headset goes on sale. 2005: Wi-Fi is officially added to Webster's Dictionary by Merriam-Webster. 2007: Apple Computer releases its iPhone—tilting the balance of power from desktop PCs and wired Internet to mobile devices and wireless Internet. 2010: Apple releases the iPad tablet, giving users all the convenience of a wireless smartphone with a bigger display closer to that of a desktop PC. 2015: Google announces its Mobile-Friendly algorithm update, rewarding websites that reformat themselves appropriately for smartphones. 2015: Wi-Fi celebrates its 25th birthday! By the end of 2015, there are 7 billion wireless, cellphone subscriptions. 2017: ITU-T predicts mobile broadband subscriptions will reach 4.3 billion (in other words, in theory, over half the world's population has reasonably fast mobile Internet access). Wi-Fi Alliance: The official worldwide industry organization responsible for developing and marketing Wi-Fi. IEEE 802.11: An IEEE website dedicated to the various 802.11 Wi-Fi standards. Wi-Fi and the Bad Boys of Radio: Dawn of a Wireless Technology by Alex Hills. Dog Ear Publishing, 2011. An inside account of how Wi-Fi was created, by one of the pioneers. Alex Hills and his team built the first big wireless campus network at Carnegie Mellon University in 1993. Wireless Home Networking For Dummies (4th edition) by Danny Briere, Pat Hurley, and Edward Ferris. Wiley (Dummies), 2011. Somewhat dated now, but still worth a look (the basic principle of Wi-Fi hasn't changed). The Innovation Journey of Wi-Fi: The Road to Global Success by Wolter Lemstra, Vic Hayes, John Groenewegen (eds). Cambridge University Press, 2010/2013. The development of Wi-Fi and how it became a global success. Why Your Next Wi-Fi Setup Should Be a Mesh Network by Brian X. Chen. The New York Times, April 26, 2017. How mesh networks can significantly improve Wi-Fi coverage in your home. If Your Wi-Fi Is Terrible, Check Your Router by Brian X. Chen. The New York Times. October 7, 2015. If you've never upgraded your router, now might be the time; newer routers are faster, more reliable, and work better over longer ranges with multiple devices connected. What's Next After 25 Years of Wi-Fi? by Jeremy Hsu. IEEE Spectrum, September 10, 2015. An interview with Dorothy Stanley, vice chair of the IEEE 802.11 Working Group, describing where Wi-Fi is likely to go next. Can I use a phone as a mobile Wi-Fi hotspot? by Jack Schofield, The Guardian, 21 February 2013. "Yes" is the short answer, but it's a expensive solution compared to mobile broadband. Anti-Wi-fi paint offers security by Dave Lee, BBC News, 30 September 2009. A metallic paint that blocks radio waves could offer improved Wi-fi security, the manufacturer claims. Wi-Fi: A warning signal: BBC Panorama, 20 May 2007. Does electromagnetic radiation from Wi-fi Internet pose a health risk? Measuring the Information Society Report 2017: ITU, Geneva, Switzerland, 2018. The latest statistics on how effectively the world is tackling the "digital divide" between developed and developing countries. 2012 Information and Communications for Development: Maximizing Mobile: World Bank, Washington, DC, 2012. A detailed report that explains how the huge growth in cellphone networks and mobile Internet is driving dramatic social changes, especially in the developing world. Wi-Fi and Wi-Fi Direct are registered trademarks of Wi-Fi Alliance.